We’ve selected these stylish earphones to be part of our assortment for our Pop-Up Store*. Not only do they offer impressive sound quality and a microphone (perfect for an iPhone and another Smartphone), but they also have a very nice monochrome color scheme, going from black to grey to white. The Pipe model is made from lightweight and highly resilient materials. It is offered with 3 sets of form-fitting silicone ear buds for a custom fit and passive noise isolation. We also like the cable-integrated microphone with call/music/volume control. AIAIAI is an audio design company dedicated to developing high quality audio products for everyday use. AIAIAI’s modern, minimalist headphones and earphones deliver clear, amplified sound. Headquartered in Copenhagen, AIAIAI is proud to contribute to Denmark’s worldwide reputation as leader in acoustic and electro- acoustic design and engineering. Read more here. 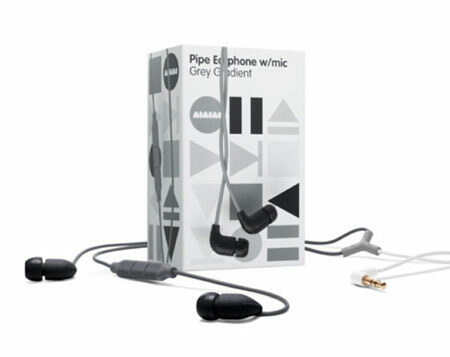 The Pipe earphones form Aiaiai are available for a limited time at www.nordicdesign.ca/shop*! * Update 2013: The Pop-Up Shop is now closed!